On 26th November the Whitechapel Gallery unveils a new site-specific commission by French Algerian artist Kader Attia. 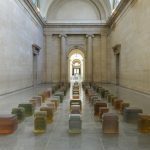 The work revisits the biblical story of Jacob’s ladder with a towering floor to ceiling structure of rare artefacts and books that will fill the lofty spaces of the Gallery. Hidden inside this library is a cabinet of curiosities filled with items from old scientific measuring devices to books by authors such as the philosopher Descartes and biologist Alfred Russel Wallace. At the centre of the work, a beam of light shines up to a mirrored ceiling creating an infinity reflection in an evocation of the tale which describes prophet Jacob’s vision of angels ascending from earth to heaven. Kader Attia’s (b.1970) multi-media installations reflect on anthropology, politics and science and are rooted in history and archival research. His works explore ideas around identity in an age of globalisation and are informed by the experience of growing up between Algeria and the Parisian suburbs, and later living in the Democratic Republic of Congo and Venezuela. 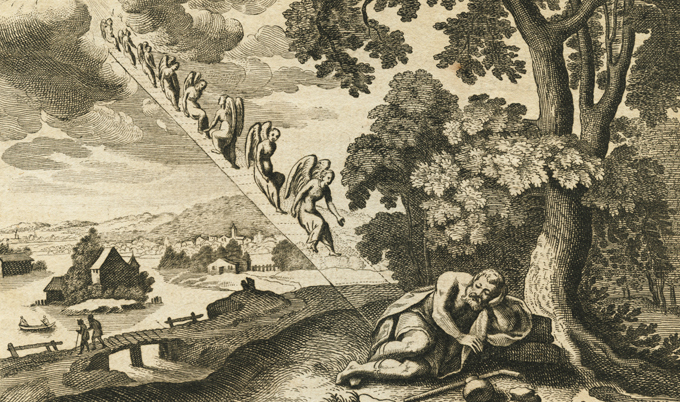 Continuum of the Repair: the Light of Jacob’s Ladder (2013), is on display until November 2014 in Gallery 2, a dedicated space for site-specific works of art. It is the result of an in-depth engagement with a space that is steeped with history as the reading room of a former library. The commission looks at the idea of books and objects as receptacles of history, continuously carrying memories with them. This concept began with Attia’s work The Repair from Occident to Extra Occidental Cultures (2012), presented at the international art survey dOCUMENTA (13), Kassel, Germany. In the last year, he has examined repair in relation to both nature and culture at a solo exhibition at KunstWerke, Berlin (2013), and for the Whitechapel Gallery commission he takes science and religion as his central focus. Past works by Kader Attia include Ghost (2006), a metallic phantom army resembling kneeling figures in prayer, or Untitled (Ghardaïa) (2009), a scale model of an ancient North African town made from couscous. For the Sydney Biennale in 2010, Attia created Kasbah (2009) in which visitors were invited to walk across an installation of corrugated aluminium and timber roofs, suggestive of a cramped shanty town. Kader Attia was born in Dugny, Seine Saint-Denis in France in 1970. He studied at the Ecole Supérieure des Arts Appliqués ‘Duperré’, Paris from 1991-3, Escola de Artes Applicades ‘La Massana’, Barcelona from 1993-4 and the École Nationale Supérieure des Arts Décoratifs, Paris from 1996-8. He was the winner of the Abraaj Capital Art Prize in 2010 and was awarded the Cairo Biennale Prize in 2008. Kader Attia lives and works in Berlin and Algiers. Kader Attia’s first exhibition was held in 1996 in the Democratic Republic of Congo. Solo exhibitions include Tsunami, Le Magasin CNAC, Grenoble, 2006, Square Dreams, BALTIC Centre for Contemporary Art, Gateshead, 2007, Momentum 9, ICA, Boston, 2007, Kader Attia – New Works, Henry Art Gallery, Faye G. Allen Center for the Visual Arts, University of Washington, Seattle, 2008, Construire, Déconstruire, Reconstruire: Le Corps Utopique, Musée d´Art Moderne de la Ville de Paris, MAM/ARC, Paris, 2012 and Repair. 5 Acts, KW Institute for Contemporary Art, Berlin, 2013. 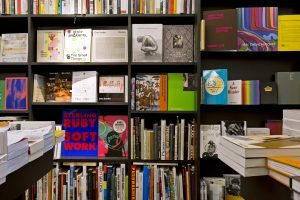 Selected group exhibitions include the Venice Biennale in 2003, the Lyon Biennale in 2005 , Geo-graphics, A Map of Art Practices in Africa, Past and Present, Bozar, Brussels, 2010, The Future of Tradition – The Tradition of Future, Haus der Kunst, Munich, 2010, Liverpool Biennale, 2012, Documenta (13), Fridericianum Museum, Kassel, 2012, Performing Histories(1), MoMA, New York, 2012 and After Year Zero, Haus der Kulturen der Welt, Berlin, 2013. 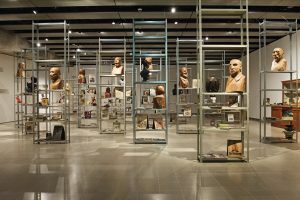 This is Kader Attia’s first solo project in the UK. Kader Attia is curated by Magnus af Petersens, Chief Curator, Whitechapel Gallery, with Emily Butler, Assistant Curator, Whitechapel Gallery. This entry was posted in NEWS and tagged Kader Attia, Whitechapel Gallery. Bookmark the permalink.